White blossom on the trees is one of the delights of springtime, but it masks a deeper magic in three of the most charismatic of British trees: blackthorn, hawthorn and rowan. Storyteller and ecologist Lisa Schneidau has some practical tips on navigating plant folklore, bringing you face to face with the fairy realms and the ways of the Other Folk….. If you were to walk towards the heart of Dartmoor, some distance on from Haytor towards Emsworthy, you would find one of the rare places on the moor with a smattering of tree cover. In the hollows of the valley, almost growing into the lichen-crusted stone walls, there are the rowan trees, all graceful fronds of pinnate leaves. Walking up towards Saddle Tor, there’s the venerable old blackthorn, forming spiky thickets where the cuckoos hide in springtime. As you climb, you will find ancient individual hawthorn trees, weatherbeaten and crooked, defiant on the exposed high ground. Blackthorn, hawthorn and rowan: these three trees hold a special place in British hearts and imaginations. They crop up in unusual places, in towns and cities as well as the countryside. I remember a cantankerous old hawthorn (may) growing on one of the road junctions between the Old Town and the New Town in Edinburgh, determined to challenge the straight lines of the railings and buildings around it. Red-berried rowan (mountain ash) stands gaunt in the Highlands alongside mountain streams, but it has also been an imaginative choice for street trees throughout the country, no doubt appreciated by the local bird populations. Blackthorn and hawthorn hedges were widely planted as an effective political device during the enclosures of the 18th and 19th centuries, and my family is one of many who have favourite places for picking sloes in the autumn. At this time of year, when the sap is rising and the hope of springtime brightens our spirits, these three trees also bear white blossom, the heralds of better weather to come. In the realms of physical ecology, trees blossom and set seed, propagating themselves, and benefitting insects while the weather is still chilly. But this blossom is also key to our folk heritage, and in my journeys through plant folklore the motif returns again and again. It seems that the blossom renews not only the life of the tree, but the life of the spirits that live with it — call that fairy, dryad, or The Other Folk. In British folklore, these trees are gateways to a different world. You may already have noticed the blackthorn blossom, the first of the three to flower: delicate plum-flowers on bare branches, punctuated by dark, cruel spikes. The widely known saying ‘blackthorn winter’ refers to this tree’s habit of flowering just before a particularly cold snap in the weather. Perversely for such a herald of spring, the blackthorn is associated with Samhain (late October) in the Irish calendar, and it represents the dark side of the year and the hag, as the hawthorn represents the light and the maiden. One folk tale from Oxfordshire, collected by the folklorist Ruth Tongue, talks of fairy justice against a farmer who dares to cut down the old blackthorn tree — the fairies burn his house to the ground. You shouldn’t mess with a blackthorn tree. In Oliver Rackham’s study of Anglo Saxon charters, the hawthorn was mentioned more frequently than any other tree, even the oak. It often marked the boundary between cultivated land and the open common. 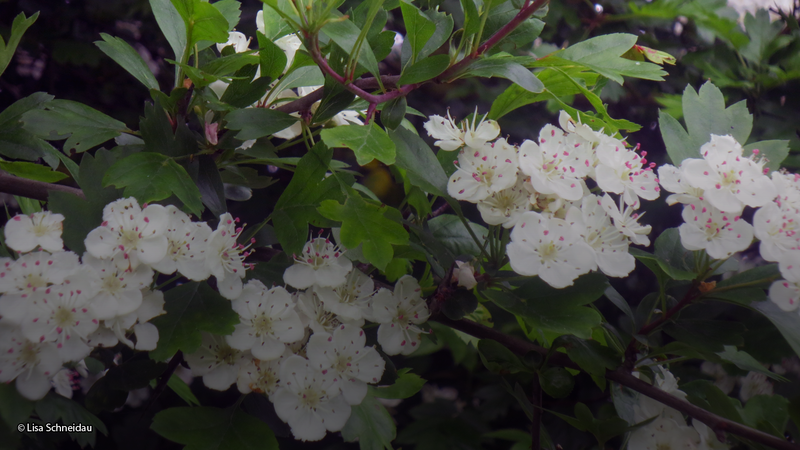 Hawthorn blossoms in April to May, after the bright green ‘bread and cheese’ leaves have unfurled. Scientists are watching hawthorn’s response to climate change, as it is very temperature-sensitive and the timing of the first leaves and blossoms varies widely from year to year. Hawthorn is beloved of many country traditions, and in herbalism it is a tonic for the heart, but my grandmother told me not to bring it indoors for fear of terrible bad luck. Its clusters of creamy white blossom have a hypnotic, faintly repugnant scent, said to smell like the Great Plague of London, or in Ted Hughes’ damning words: ‘a nauseous, sweet aniseed scent.’ But the blossom is also said to aid love and fertility, as long as it is kept outside! Hawthorn is, above all, the fairy tree, tree of enchantment and magic, particularly when it is a lone tree in the landscape. In many places in Ireland, if you sit under a hawthorn tree on a fairy hill on Beltane, you will be whisked away for good to the fairy underworld, and wishes might be granted to you (as in the old Manx tale of the Fairy Tree, where a young girl is given help with an impossible task). But as with the other white blossom trees, if you dare to destroy a hawthorn, you will regret it. They say that John DeLorean found a lone hawthorn tree in the field where he wanted to set up his car plant in Dunmurry, Northern Ireland. His builders refused to destroy it and so DeLorean himself bulldozed the tree, apparently bringing bad luck to his enterprise. Our third white blossom tree, the rowan, is a tree of light and fire like the hawthorn, but more upland in character. It has fine, complex leaves (hence its other name, mountain ash) and clusters of heady flowers in May. Rowan is the Quicken Tree, Delight of the Eye, The Wizard Tree, a protection from enchantment, dark magic, and illness. It was planted near houses to protect the inhabitants, and kept in the byre to protect cattle and milk alike. (Are any of us still drinking milk that has been produced under the protection of the rowan tree?) Carrying two rowan twigs tied into a cross with red ribbon was protection against the spirits of the dead at Samhain, sometimes very practical protection from attack out on the moor. Although the blossom and berries of the rowan are striking, the timber was equally valued for its protective properties. 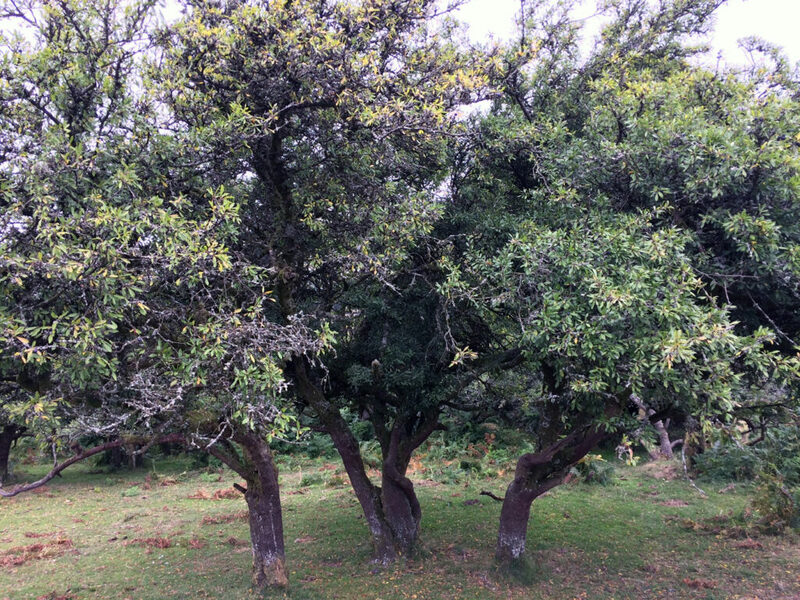 These three trees are very different characters in our folklore. 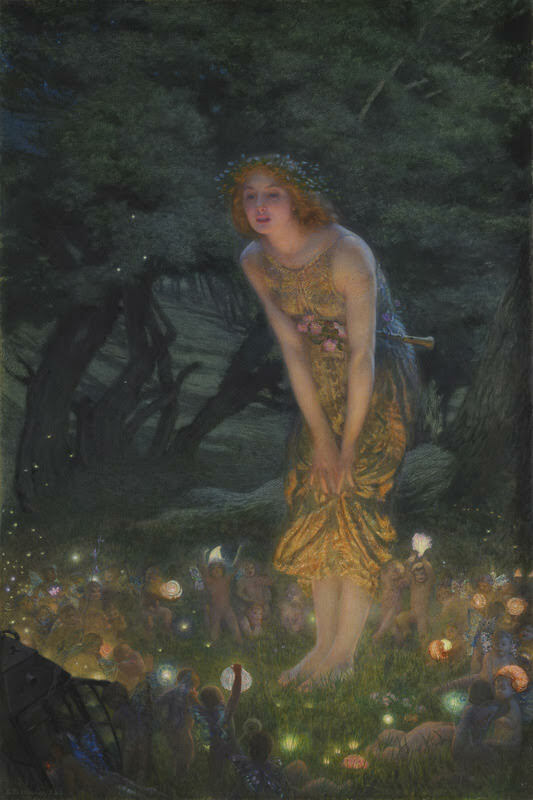 Time and time again in the old stories, they are the interface between human-world and fairy-world. But they are not just some fancy notion or ancient wisdom now lost. These trees are real and alive and flowering somewhere near you this springtime. You don’t need to be on Dartmoor or in other wild and wonderful places, they are also common trees in towns and cities. So I have a suggestion for you. Go and seek out the blackthorn, the hawthorn and the rowan tree this spring. Spend some time with them… think about their history and what they might have seen… and perhaps even make a wish. Surely what we need in the world right now is justice, magic, and protection — for all of us, human and non-human alike. I’m collecting folktales of trees, woodlands and forests of Britain and Ireland to share in storytelling and print, so that our folklore can be passed on and used in environmental work. If you have a story you’d be happy to share, let me know! Hughes, Ted (1977) Gaudete. Faber & Faber. Mabey, Richard (1996) Flora Britannica. Sinclair-Stevenson. Paterson, Jacqueline Memory (1996) Tree Wisdom. Harper Collins. Rackham, Oliver (1986) The History of the British Countryside. J M Dent. Schneidau, Lisa (2018) Botanical Folk Tales of Britain and Ireland. History Press. Vickery, Roy (2010) Garlands, Conkers and Mother-Die: British and Irish Plant-Lore. Continuum. 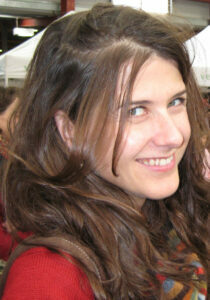 Lisa Schneidau is a storyteller and environmentalist based on Dartmoor. She seeks out stories about the land and our complex relationship with it. Lisa is the author of Botanical Folk Tales of Britain and Ireland (History Press, 2018). You can find out more about Lisa’s work at her website and blog.